For Three Device and a End Position for Terminator. Ultra320SCSI LVD Translucent Silver Round Internal Cable Connects up to six(6) UltraSCSI HPDB68 (MicroD68) LVD/SE CD/DVD or hard drives and supports speed up to 320MBps. This premium cable has twisted pair wiring, silver braid shielding with translucent jacket and an extra connector for a terminator which eliminates the need for expensive pass-thru type terminator. It allows you to connect your SCSI devices with minimal clutter and recommended for high performance PC and high-density rack mount servers. In addition to being coated with flexible material for better wiring protection, these cables reduce heat and save space within the CPU, and makes it easy to add or remove hard drives & add-on cards. Excellent Construction Improves Air Flow. Used in High End Servers using SCSI Hard Drives. 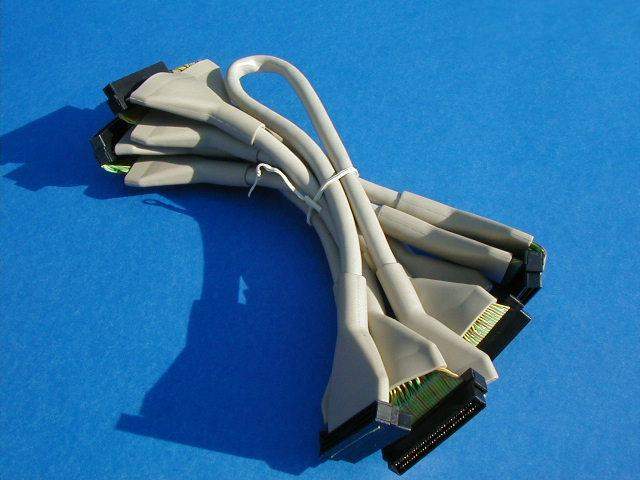 A Professional Cable for Hi-Powered SCSI Applications.